Everybody should know a guy….. 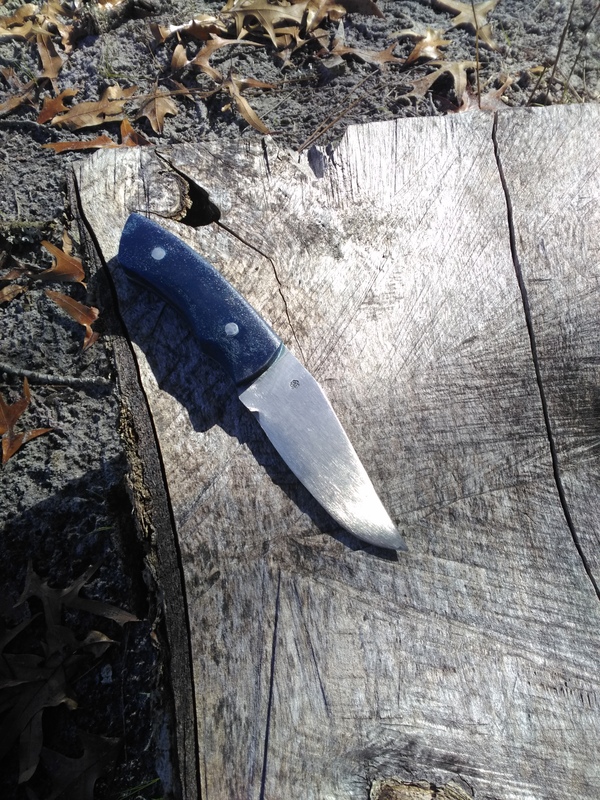 So, I call myself a Blacksmith, mainly focusing on knife making. 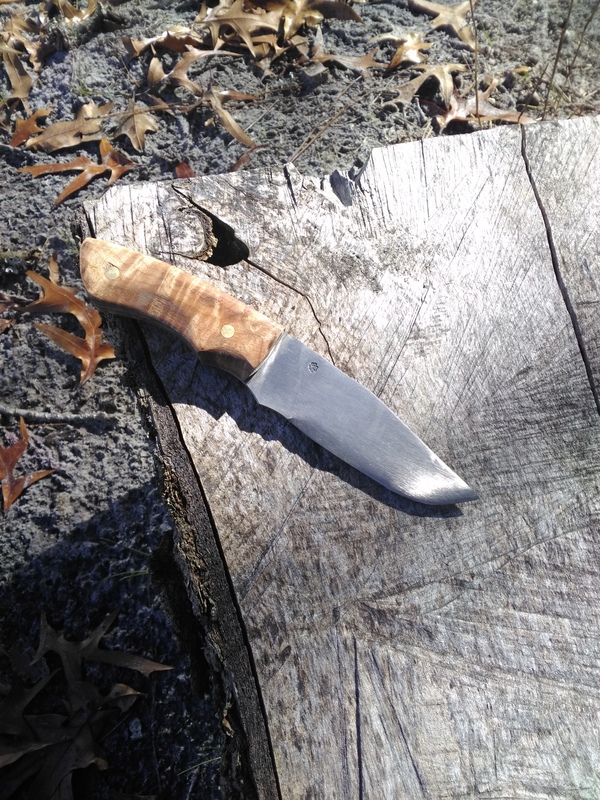 In a roundabout way then a Bladesmith. However, in the true sense of being a Blacksmith, I make a lot of different things. Some guys I work with and some other friends are woodworkers and tend to look for special tools that they can’t buy at the local hardware store. That’s when it’s nice to be able to say, “I know a guy”. That line has become a bit if an inside joke at work (my other day job). Anything somebody is thinking about needing they always say “I know a guy”. 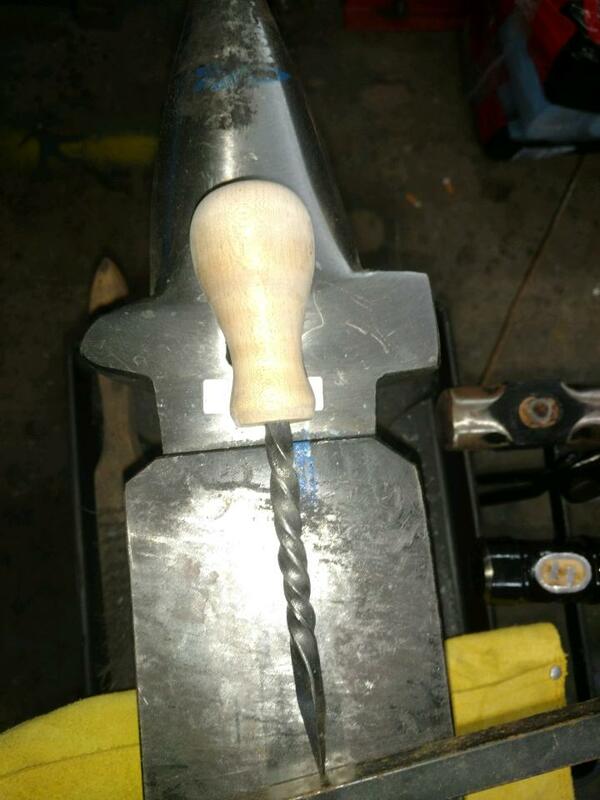 I was challenged by one friend who does very fine woodworking, he wanted a birdcage awl. Done. I can also embellish existing tools or items. 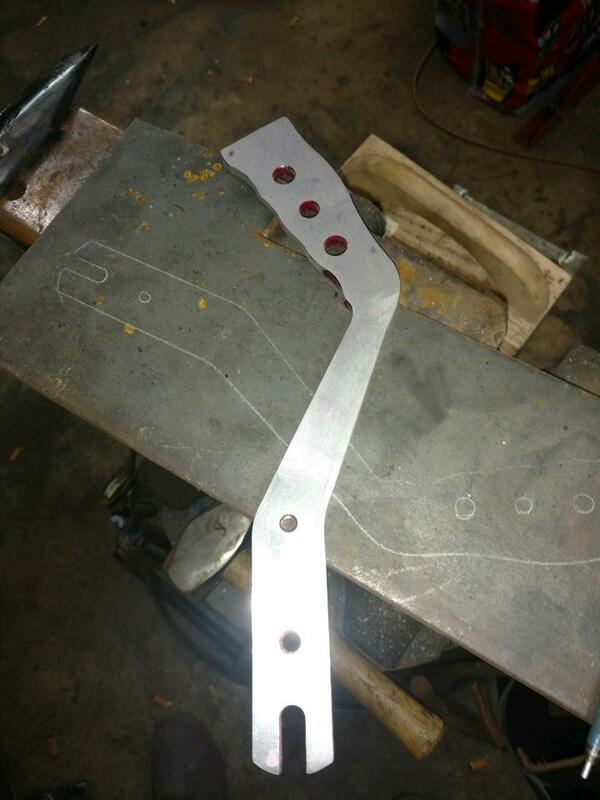 I had a friend bring me a pistol grip shifter handle for a classic car that he is restoring. The steering wheel is steel and Rose wood. He wants the grip of the shifter to match. 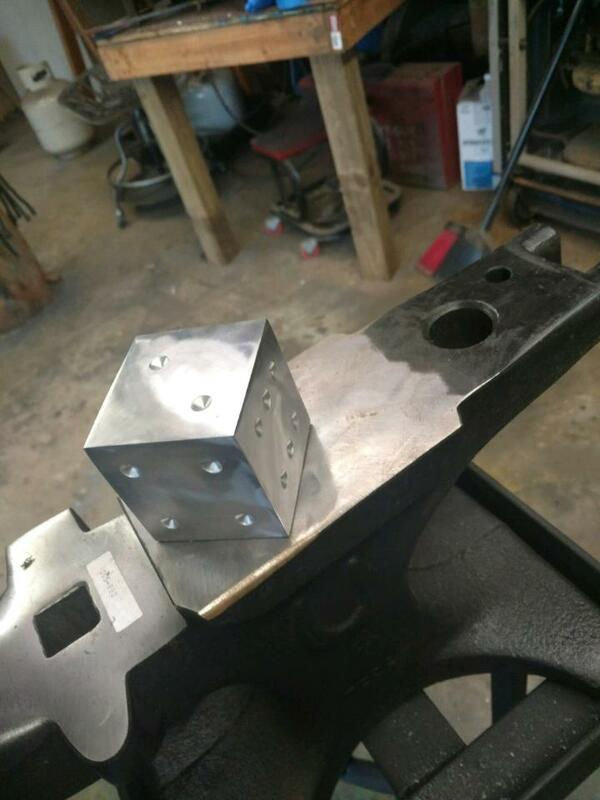 And not by any request, but just for giggles I made a large, stainless steel die. It’s 2.5 inches cubed and weighs just over 4 pounds. How would that be for a yahtzee set? Maria and I hope that you all have wonderful New Year! 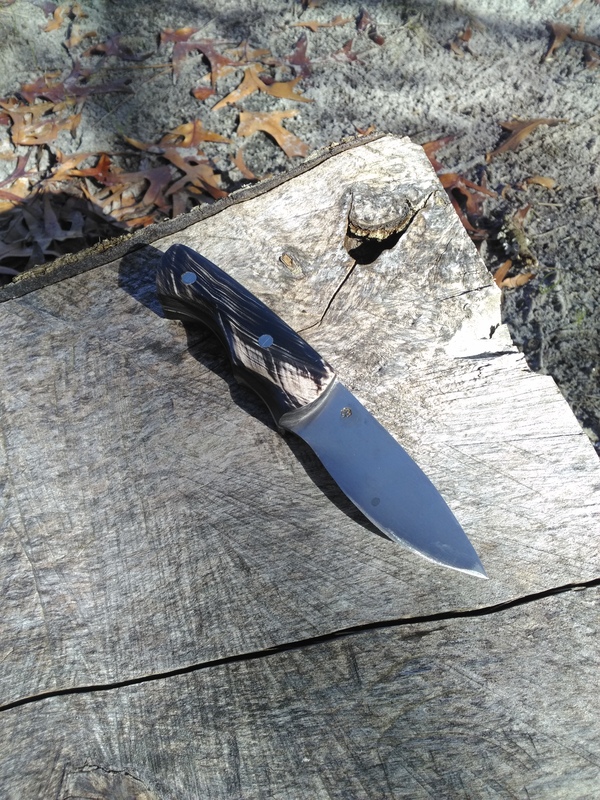 After a fairly busy Christmas selling season, I found that the number of completed knives that I had available had dwindled. I spent a couple of days in the shop working like a fiend to try to rebuild our inventory. I came up with these three beauties. All three are made from 1095 carbon steel. The top one has a handle made from blue sand set in epoxy resin, making it fee like sandstone. The second one is handled in maple burl. Its got some wonderful grain in the wood. The third is buffalo horn. I’ve got several more forged out. I just need to finish them out and figure out the handle material. And remember, if you are planning on being in eastern North Carolina, take some time to take a blacksmithing class. Work seems to be progressing well now on the farm. For months it seemed like we were swimming up stream, but now things are falling into place fairly well. I was able to get three out of walls framed and braced on the sewing cabin. I’m a great blacksmith, but only a mediocre carpenter. Framing walls on the deck, standing them up, and bracing them all by yourself is a little bit tricky. Ok, its a lot tricky, but sometimes you’ve just got to get after it. I think this building will work perfectly for what we plan to use it for. It will initially be used as a cabin, and then once the house is complete it will be Maria’s sewing studio. Not too bad of a work environment. I did use ole Darla as an anchor for some. Climbing rope to help hold the wall until I could get it braced. I also got the 946 foot driveway widened to just over 15 feet. This will allow us to lay the carpet and gravel wide enough to drive comfortably without the trees and brush closing in on you during the summer months. I forgot to get photos of that. I left on Saturday afternoon to come back to the beach. They were calling for rain and if you don’t get out of there before it starts raining it gets a little dicey. Without the gravel on the driveway the red clay gets really slick. So, its either get out before it rains or hunker down until the ground drys. I chose to get. So, this all happened just before Christmas eve. We hope that you all have a very Merry Christmas, and an absolutely glorious New Year! Where we live now isn’t really a tight knit type of people. We have met some great folks, but it doesn’t feel like a community. A community where everyone does what they can to help others. Where the farm is located is a little bit different. We haven’t had the opportunity to fully immerse ourselves into it, but we’ve seen it. The gentleman who lives a cross the road who introduced himself and gave us his phone number in case we ever needed anything was the start. That being said, there are a number of other community type groups. We have an Etsy shop, and the forums on that website are wonderful. They are full of great people willing to answer questions, make suggestions, and generally help other sellers there. Just wonderful! And here. I posted the other day about the start up of our blacksmith school. Not only was that post liked and read, it was reblogged by a few other folks. I am truly overwhelmed with gratitude for this and appreciate each and everyone who reads our blog. It may not be War and Piece, but its our life and we are proud of it. Thank you to the wonderful WordPress community, and Maria and I hope that you have a wonderful upcoming 2018. As busy as we are, there will be tons of more posts on the way from us. All the best, Merry Christmas and Happy New Year! Today was the very first class for our blacksmithing school. I had two students, Anthony, and Shane. They were great students and did very well. We spent a good bit of time discussing shop safety and tools selection. Especially after hearing about the knucklehead from upstate New York who burned down half a town by trying to forge a blade in a burn barrel with a 30 mph wind. I had a great time teaching and I think they had fun learning. We finally posed for a “graduation” photo. You can’t see it very well in that photo, but this is the first project they made. These guys did a fantastic job, and both expressed interest in continuing on with more advanced classes. So, things went great, and I believe that this is a good start to something wonderful. Maria and I hope that you all have a great Christmas.